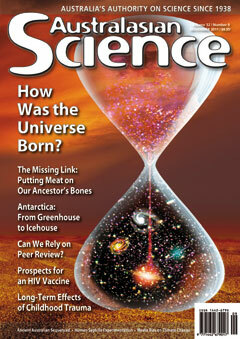 Cover Story: How Was the Universe Born? Last year scientists thought they had found the “missing link” in the evolution of apes to humans. Now they have dated the fossils precisely between the last occurrence of Australopithecus and the first members of the genus Homo, and described anatomical features that suggest it is indeed a transitional species. When children are exposed to a traumatic event, most of them experience distress but eventually recover. Which factors predict persistent problems? An ambitious drilling expedition off the coast of East Antarctica is looking for evidence linking declining carbon dioxide levels with the glaciation of subtropical Antarctica 34 million years ago. Potent antibodies force the HIV virus to mutate, opening up a new strategy for producing an effective HIV vaccine. Feature: Peer Review: Can We Rely On It? Science depends on peer review. Is sloppy or hurried review a serious problem, and if so what can we do to fix it? Teachers need to encourage science students to develop their representational skills. Australia needs to develop better incentives for public–private sector collaboration. Eco Logic: A World of Difference? What does the genetic sequencing of an ancient Aboriginal man tell us about the ancestry of Aboriginal Australians? Evolution has hard-wired us to make mistakes. President Obama’s bioethics commission finds that US experiments in post-war Guatamala turned a blind eye to ethical concerns. Working in management expands the hippocampus, potentially protecting this vital area of the brain against Alzheimer’s disease in later life. The deep ocean remained iron-rich and devoid of oxygen far longer than previously thought, analysis of mineral deposits such as Mt Isa suggests.